When $25 billion baby Hudson Yards first announced its arrival way back when, it had some of the nation’s (and world’s) most celebrated chefs clamoring to claim spots and fill them with ambitious new concepts. And the results don’t disappoint, with offerings from some of the biggest names in the food world. From glam, full-service eateries to grab-and-go markets, here’s where to eat at the city’s shiniest new mall. Nobody knows how to create a line around the block better than David Chang, and the newest eateries in his Momofuku empire do just that. First, there’s the brand-new Kāwi, a 5,000-square-foot restaurant, helmed by chef Eunjo Park, that fuses Korean flavors with fine-dining techniques (think “Wagyu Ragu” rice cakes and “Kawibap” with candied anchovy, omelet, trout roe and uni). Next door is Peach Mart, a takeaway shop offering sandwiches, kimbap and plenty of Asian candy and snacks. And lastly, there’s an outpost of the already beloved Fuku, which doles out its famous spicy fried chicken sandwiches along with cheesy breads, sweet-and-sour mustard greens and chickpea mac. It’s all about España with this superstar collaboration between Spanish chef José Andrés (known for his D.C. restaurants and his incredible humanitarian work) and brothers Ferran and Albert Adrià (formerly of the celebrated elBulli). The space features three full-service restaurants: Leña, dedicated to paellas and grilled meats; Mar, which is all about seafood imported from Spain; and the forthcoming Spanish Diner, a casual all-day hangout. There’s also a bar dedicated to Spanish cocktails and another to Spanish wines, plus 15 food kiosks, organized into categories like churros and jamón y queso. This global eatery from London’s Rhubarb Hospitality is inspired by chef Peter Jin’s travel journal, where he kept his recipes and ideas and combined them to create original and inventive dishes. The East-meets-West menu includes the likes of a foie gras custard with barbecue-and-nori-spiced rice crackers, Japanese risotto (with mushroom, yuzu and miso butter) and curried lamb momo. This bi-level space from chef and restaurateur Costas Spiliadis (there’s a sister location in midtown) comes in two parts: The fifth level houses Milos wine bar, featuring Greek wines, cocktails and shareable mezes. By day, the wine bar flips to an all-day eatery featuring a real Greek yogurt bar, freshly made food, coffee and pastries. The winding staircase leads upstairs to the sixth level, which houses a full-service restaurant with an outdoor terrace complete with sweeping views. Fish and seafood are flown in daily from Greece, Portugal and Spain. There’s no separation between the back and front of house here, so diners can check out an oven for baking bread and pita and the Fish Eye, a glass-enclosed holding room where guests can watch the entire fishmonger process from start to finish. Bone broth on tap? Yup, it’s a thing. The buzzy organic meat company has a new home in NYC, with proteins sourced directly from its farm in Northern California. The sit-down meat experience—complete with a butcher case as the center of the space—features dishes like a 100-day dry-aged burger with raclette cheese, duck confit poutine and NYC-only exclusives like beef bone broth Italian wedding soup. Belcampo also features a bone broth bar with beef and poultry taps, and a retail fridge with grab-and-go packages of steak, bacon, salami…you get the idea. This restaurant from the California chef and cocreator of the Hudson Yards dining program honors retro classics such as New York strip, oysters Rockefeller, roasted chicken for two and ice-cream sundaes for dessert. The vibe is old-school American glamour, complete with velvet banquettes, white tablecloths, Champagne carts (!) and live music. 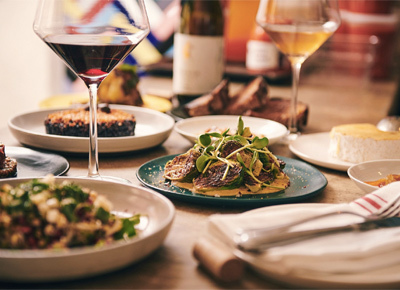 Another London-calling restaurant, Queensyard brings some English flavor to NYC with a menu of dishes like venison Scotch egg, ox cheek hash, smoked haddock and salmon fish cakes, and bangers and mash. The four-part restaurant is a mix of a  daytime grab-and-go café, a relaxed kitchen with communal tables, a cocktail bar featuring classic gin-based cocktails and a cozy, sophisticated dining room with breathtaking views of the Vessel (you know, that iconic metal sculpture everyone is posting on Instagram). Caffeine fix? Pick up a cold brew at Blue Bottle, Jack’s Stir Brew or Bluestone Lane. Sugar craving? There’s Van Leeuwen, Bouchon Bakery, Li-Lac Chocolates, William Greenberg Desserts and Kith Treats. Antioxidant boost? Grab a functional elixir from the Drug Store by Dirty Lemon. Hybrid spots with multiple specialties have something for every mood, like Cook & Merchants (a market with grab-and-go food, a chocolate counter, a coffee bar, and wine and beer), Teak Tearoom (tea and light fare by day, tequila by night). And we’ll never turn up our nose at a new Shake Shack.